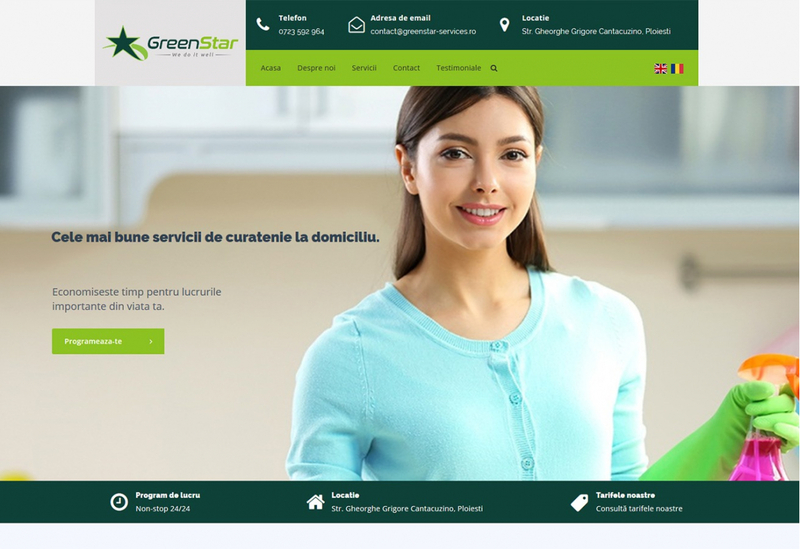 The http://www.greenstar-services.ro/ website highlights the modern and interactive design services provided by GreenStar Services. The intuitive display of contact information and placement in key areas of the platform gives users a unique experience of navigating and getting the data they need with a single click or scroll. At the same time, the "Schedule" button placed in the first screen after accessing scrolls the user directly to the most important site, namely the booking form for a home cleaning session. Through it, the administrator receives relevant information about the details of a schedule and the user can select the date, time interval, the desired service, the employee to move, the method of payment, etc. Having direct control over the service you reserve. The administration platform allows optimization of the search engine site: meta features; Image optimization, sitemap, conversion and tracking codes, etc. GreenStar Services offers professional residential cleaning services and commercial spaces in cities such as Bucharest, Ploiesti, Targoviste or Buzau. Passing on the market recently, they were remarked from the start with impeccable service and seriousness from the staff. GreenStar Services uses Karcher's professional cleaning equipment, detergents, solutions and high-quality equipment. and clearly in the shortest possible time. GreenStar Services strongly recommends you to use XFactorApp for your future projects. We will surely come back.